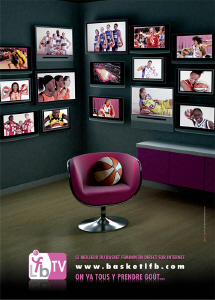 March madness in the Ligue Féminine de Basketball has finally arrived. Starting this weekend the clubs will all play five matches in 21 days. This is not all. The eight clubs still left in the coupe de France will play a maximum of two games over the weekend of the 22/23 March. There will be also April madness as the teams have three more games in the first week of April. The regular season championship title could be decided on 29 March. This is the date when Bourges Basket and USVO play each other. Bourges Basket, USVO and Lattes-Montpellier are currently occupying the first three spots in the table. Based on their current form they should hold their positions in order to participate in the championship play-off and Federation Cup at the end of the regular season. However a drastic drop in form by any of the top three teams could see them getting involved in the battle with the teams currently challenging for fourth place. At present six teams, positioned 4th through 9th, are in competition for the fourth championship play-off spot. Failure to make the championship does not imply the end of the season as the clubs will still be hoping for a good final position to gain home advantage in the second leg ties during the challenge round. At the bottom end of the table Mourenx Basket and ASPTT Arras have to start winning games if they plan to leave the relegation zone. Calais, Tarbes and Aix-en-Provence are in no-man-land at the moment. A series of good results may improve their ranking for the challenge round while negative results may see them back in the relegation zone. LFB March madness is 35 regular season games including four games streamed live on LFB-TV, as well as a weekend of action in the coupe de France.